SolarScreen also design, cut and install manifestations. 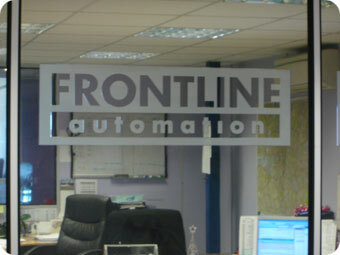 Manifestation Window Film can take the form of coloured, frosted or sand-blasted effect vinyl film. Ranging from a simple band or row of dots, squares or any other shape to your company logo or bespoke design. We have the latest computer software and cutting facilities to ensure that your requirements are met accurately. Our most popular material for this work is Opal Frost and Silver Frost Window Film. We also have a wide range of Frosted and Dusted Crystal Vinyl’s in stock. All will achieve the exact look you need at a fraction of the cost of sandblasted glass. If you ever want to change the design, it can easily be done without having to change the glass. Please contact us for design options and samples.